We have covered several hacks that extend the functionality of popular Activator tweak. Today we have got another interesting Cydia tweak called Cmdivator that does the same, allowing Activator to run executable programs based on user assigned actions or events. The tweak adds new options to Activator that can be assigned to execute programs based on its gestures or actions. While Cmdivator seems like a boring and advanced tweak it is certainly a fun one for those who actually know how to use it. The tweak is meant for both normal users and Cydia developers. Users can add commands to the Cmdivator directory while jailbreak developers can take advantage of it as well to develop tweaks for it. 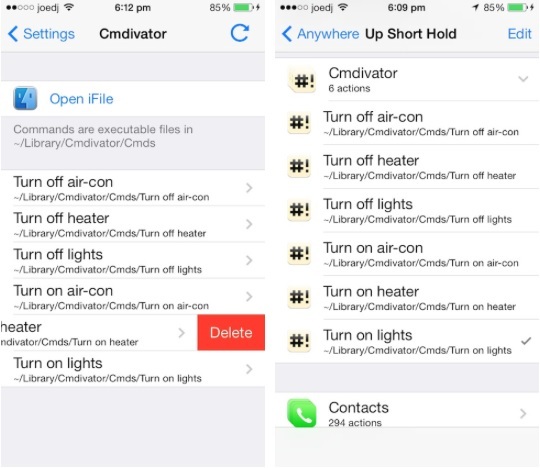 Cmdivator watches its directory and if anything is added to it, that command is automatically made available to the Activator app, where it can be assigned to an event or action. Users can add commands to ~/Library/Cmdivator/Cmds. Developers can add commands to /Library/Cmdivator/Cmds while using net.joedj.cmdivator. While we have not tried the tweak ourselves the Cydia screenshots of the tweak showcase actions like turning on or off heater, lights, air conditioner and more. All of this will be done by simply performing an Activator gesture, which is something you should certainly try if you have the expertise. If you do then let us know about your experience in the comments section below.